In honor of the Black Swamp Arts Festival happening in Bowling Green this weekend, I thought I should share something artistic. Every fall downtown Bowling Green Ohio hosts a lovely festival that features local artists, musicians and food! There are family friendly activities, opportunities to shop and listen to some amazing live music! I will be at the festival Sunday to collaborate with the BigFabLab and run a photo booth! Pondering the idea of "Art" inspired me to post these images of Nicole! Most of the time I am shooting for my job. I take portraits or I am documenting a commercial business. While all of my paid shoots involve my personal creativity, there are definitely expectations to get certain poses, light styles, a specific look. I am very happy to accommodate all of these things and often I also get to play a little for myself, but there is something truly refreshing about creating just for yourself. No expectations except your own. Having freedom to play and try new things helps me to grow as an artist and to give me new ideas to implement in my everyday sessions. Nicole is so easy to work with! She can strike a pose with no prompting and she always dresses to impress. Working with a practiced model is a luxury because I am typically explaining to my subjects how to pose. When I do not have to worry as much about posing, I feel my brain exploring more creative ideas pertaining to light and style. 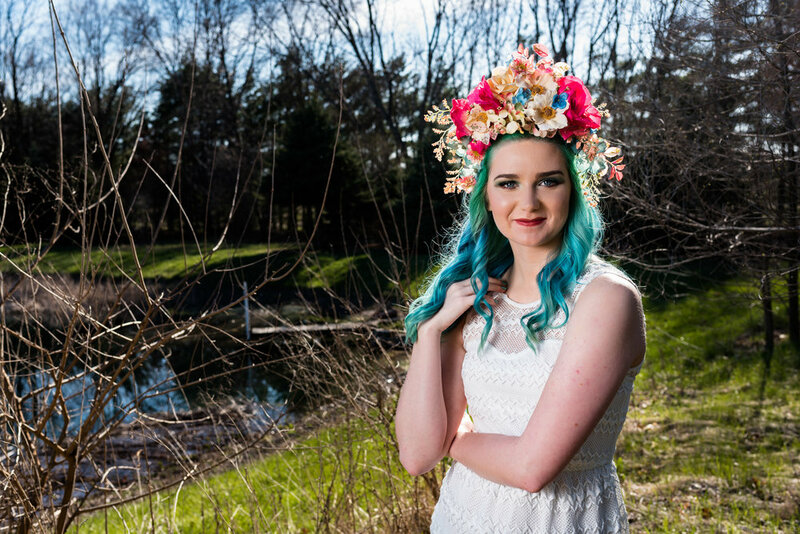 Nicole created this amazing flower headpiece that is featured in this set! You should be sure to check out her etsy shop for more of her amazing creations! I hope you all get a chance to visit Bowling Green for the festival this weekend! I also hope you enjoy a sample of a different aspect of my photography!